The C2 Sprite Manager (C2SpriteMan) was written by me, Lernie, and is a Python (exe wrapped) that views and modifies image files and their corresponding data as it relates in a .caproj (C2 project) file. This project was originally done for LW (called LWC2), and for speed and flexibility, I migrated the code to Python and turned it to a Windows-based utility. This tool revolves around a specific pipeline which involves mass creation of sprite assets from LW (or any 3D prog) and then conforms those renders to something that can be plugged into C2. The tools works upon existing Sprites as they are defined in the .caproj file. This is due to the fact that ‘sid’ attributes in C2 might be better of be maintained by the host prog, so new objects are created only within C2, not externally. The tool organises sprite graphics into ‘units’ (left panel) From ‘units,’ the individual sprites are displayed (right panel) where the name, its version number, frame duration, image-point file and crop-file and crop-image-point file validation, speed, looping and such parameters as found in C2 itself. First, the frame number is determined by the actual number of frames found in the unit’s folder, and is used to debug if more or less frames were rendered than expected. There is an option to preview the unit animation using djv (hard-coded, so it djv must be installed). The frame rate is fed as an argument in djv so it mimicks what you would expect to see in C2. Again, each frame of animation has a corresponding image-point file, and are named in a specific convention that makes their relationship apparent. Note the use of the ‘NULL’ name. This is a constant name. Remember that these files are contained under the unit animation folder, so they are unique; there is no need to make them unique from other units as C2SpriteMan identifies the image based on the folder they are in, very much the same way C2 does it. The next step is to crop the sprite, and ImageMagick (IM) is used as the tool for it. 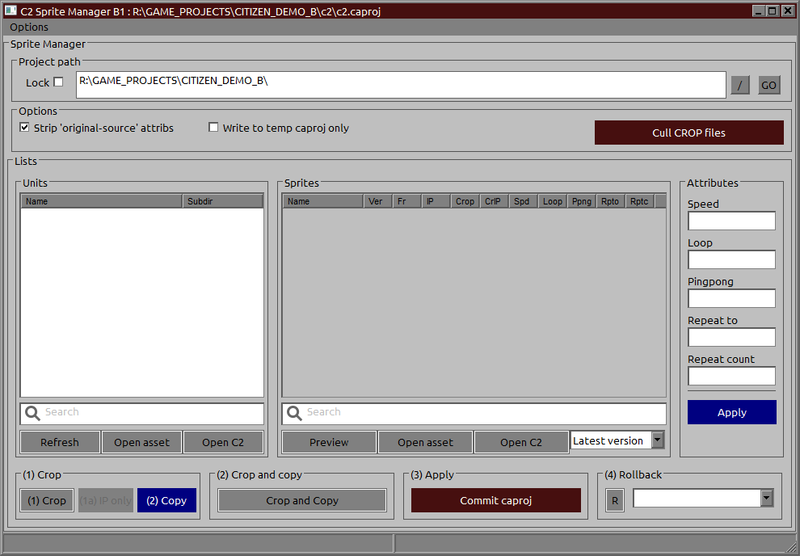 In this process, IM outputs a file that defines the cropping operation that it has done on the image. Since any number of sprites will most likely have a different cropping result from each other, this information is important because I can use it to modify the image-point file, which changes based on how much was cropped from its partner NULL file. The copy procedure transfer all renders to the C2 folder in strict accordance with how C2 expects them to be: file names are stripped down, and become the ###.png format, and are put in their own sprite folder. They were managed in 3D in the same way as C2 to make this process easier. Once copied, all data can be ‘committed’ to the .caproj file. What ‘committing’ means is that any parameter change made to the sprites (eg changing Speed) will be updated in the .caproj file. This is a write operation on the .caproj, and a backup is made every time it is done. There is a drop-down menu on the lower-right that allows for rolling back to a previous version. I’ve just explained the process, but not in the sequence that it would otherwise be done. So this could be confusing reading for my future self. So this is how it’s done from the top-down. Note that .caproj (folder-based projects) is necessary to use, for obvious reasons. In C2, Sprite objects must be create beforehand. It is important to name the Sprites accordingly because this is essentially the unit name that need to correspond with the renders in 3D. For purposes of illustration, let’s call our unit ‘hunter’. Save the .caproj so that these modifications are reflected in the file. First note the /units subfolder under the /renders folder. This is mandatory token. Then <unit> represents the name of the sprite unit (‘hunter’). Though there is a <version> token, this doesn’t have to be used, though it is much better to use it because you can juggle around variations quickly. Note ‘IP’ is also 0. This means that there either have been no image-points generated. The number of IP should be the same as the number of Fr. Note ‘Crop’ is 0, which means no cropped images have been detected.. ‘CropIP’ is the same deal. Lastly, note that the C2-related parameters like ‘Spd’, ‘Loop’, etc, are -1. -1 means that no change should be done when you hit ‘Commit caproj’. If this value is larger than -1, then that value will be set in the .caproj as your desired value. Let’s say now that some frames were rendered from the 3D application, and move on. This step can be done at any point even after cropping. You can preview the animation using djv. It takes the ‘Spd’ parameter and uses that as the framerate. If ‘Spd’ is -1, then djv will play it back with whatever default it selects. On the far-right side, an Attributes panel shows the fields which you can adjust parameters of selected sprites. Hitting the blue button ‘Apply’ will apply your changes onto the sprites. These changes are stored in their respective unit folder, so that these settings are portable and will carry over as long as you keep those files in the folders they are meant to be in. Generating imagepoint files in LW means getting the projected camera-view space coordinates of a particular 3D location. 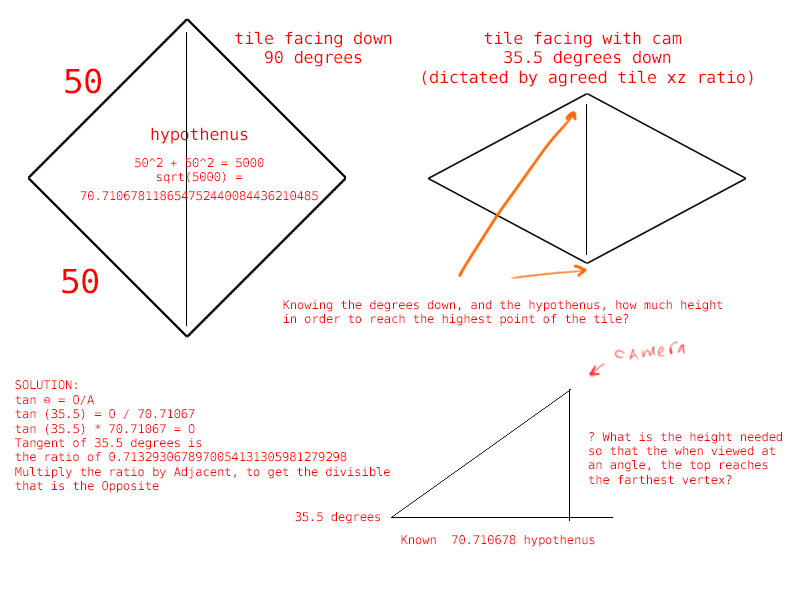 I’ve done this in LW using LScript but this is a 3D-specific solution. I’ve not it in Maya, and I reckon it would be a different solution. Either way, the generation of imagepoint files must follow the rules outlined in the first section. Once the imagepoint files are done, C2SpriteMan should reflect a corresponding value in the ‘IP’ column. After generating imagepoint files, the next step is to crop the sprites. This not only crops the sprites but it also ‘crops’ the imagepoint files accordingly, taking the values there and trimming them so that the cropped imagepoint files will have values that register with their corresponding cropped spirtes. The next step is to immediately copy the sprites over to the C2 folder. After copying, you can then commit. First, select the unit animations you want to effect. Then hit ‘Commit caproj’. This function looks at all the settings of the selected animations and goes through the .caproj, parses it, and applies the XML settings. Hotspots and image-point attributes are derived from the .imagepoint files, while the frame-related settings are derived from the other individual settings inside the 3D unit folder. Frame duration is applied based on the number of CROP sprites detected in the 3D unit folder. Open up C2, and confirm the settings.